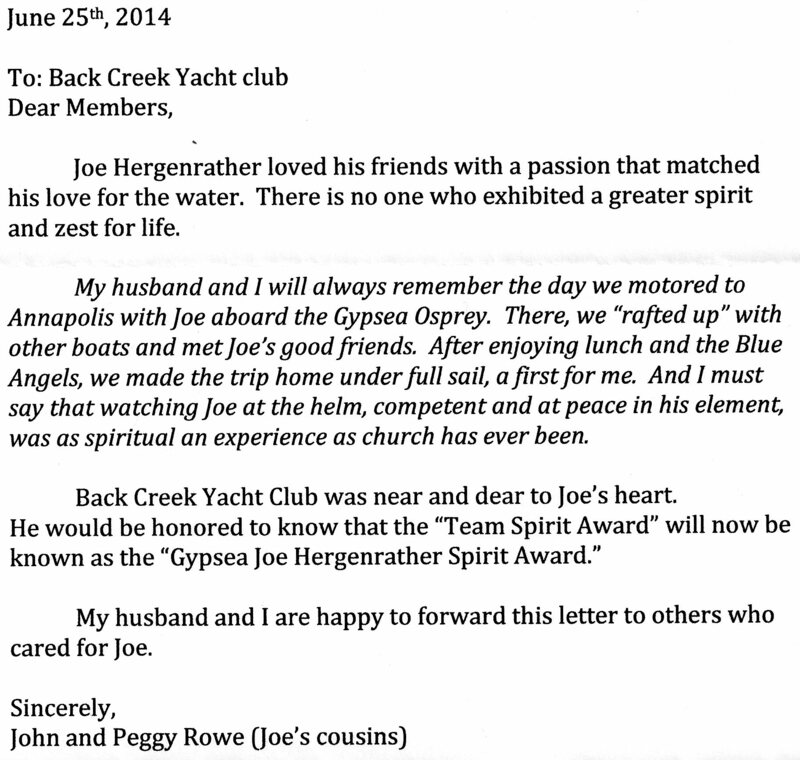 Below you will find communications between Commodore Bill Kranzer and the family of the late Gypsea Joe. Since its founding, the Club has annually presented a “Team Spirit Award” to one or two members whose involvement exemplifies the qualities of participation and service. Past winners, volunteers all, have recruited new members, planned/organized/hosted events, provided administrative support, and boosted the level of enjoyment for all members. A perpetual plaque honors all the awardees, and mementos are presented to each. This year, the Board of Governors has rededicated the honor and it will henceforth be the “Gypsea Joe Hergenrather Spirit Award.” Joe’s thoughtful gift will fund future mementos and inspire us to promote Joe’s legacy of generosity and love of boating. The Club’s website (www.backcreekyc.org) currently features Joe on the homepage. As the only known liaison with Joe’s family, you are the recipient of my letter. I hope you will share the content freely with all who knew him. February finds many of your fellow bakyakkers escaping the Polar Vortex. Sixteen members gathered yesterday at our rental condo in Stuart, Florida. Others are elsewhere in the Sunshine State. Linda Gabriel is recovering from her recent surgery here, and after a brief stay in a rehab center will convalesce a few months here on the Treasure Coast. I wish to thank all who attended the Ball in January. Your participation and generosity (silent auction) made for a memorable evening. Kudos to Rosie for making it happen! Your commodorable and I will miss the basketball game this weekend. GO NAVY! Please renew your memberships and sign-up early for events. Your hosts rely on your cooperation. I'll be back in Annapolis in mid-March. 'Till then ............ UP THE CREEK!